Many people (myself included), sit at a desk all day, hunched over a monitor. Obviously, this isn’t good and can eventually lead to symptoms such as back and neck pain. Martial arts teach proper posture and can help to counter the damage caused by sitting down for over eight hours a day, five days a week. The right combination of upper body, core, and lower body training is essential to martial arts and total fitness. Rather than simply lifting weights, using martial arts for fitness can help to improve functional strength. The ability to stand on one leg and properly execute a front kick is an example of a basic movement in martial arts that requires balance and flexibility. If you don’t have it when you start, martial arts will help you develop it! 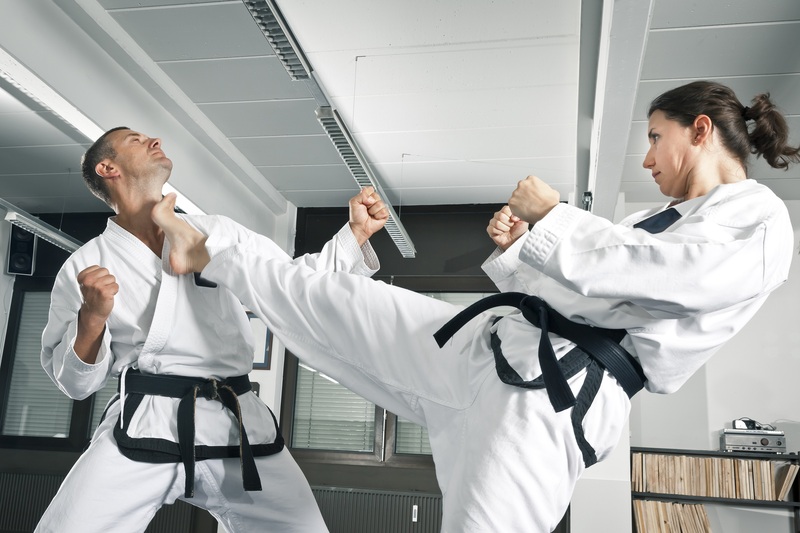 In addition to the physical movements and calorie burning, martial arts also teach self-control, which is essential to successfully losing weight and achieving your goals. Martial arts provide a safe outlet for relieving stress and anxiety rather than holding it in or taking it out on your boss at work. When you go into martial arts, you can expect a full-body workout! The ability to outlast an opponent both physically and mentally is key to success in martial arts. Known for isometric exercises, long, demanding stances and tons of calisthenics, karate helps to improve your flexibility as well as physical strength. Kung fu involves high-intensity movements which provide an excellent aerobic and cardiovascular workout. You’ll strengthen your legs (try holding a horse stance for 30 seconds if you want to know what I mean! ), as well as your upper body. Ready for a killer cardio work out? Thai kickboxing, also called muay thai, will have you kicking and punching a heavy bag or partner-held pads for a grueling workout. Twisting for kicks targets your core as well as your legs, and even holding the pads for a partner will have you feeling the burn in your arms. If you want a challenge, but punches and kicks aren’t your cup of tea, try Brazilian jiu-jitsu! A demanding, full-body workout, BJJ revolves around grappling with an opponent. You’ll be amazed at how much exercise you can get without ever standing up on the mat! On the other hand, if you’re not one to shy away from combat, you could try taking an MMA class! This high-intensity training blends standing striking and kicking with grappling and groundwork. If you’re new to martial arts or fitness programs, however, this probably isn’t the best place for you to start. If you’re older, injured, or not in the best cardio shape, Tai Chi is a great starting point. It helps you to slowly build strength, flexibility and stability in your muscles before moving on to more intense forms. No matter where you are in your fitness journey, there’s a place for you in martial arts. Young, old, beginner, or experienced, starting martial arts for fitness reasons can be one of the best decisions you’ll make for your health. Martial arts can help you gain functional strength, improve your cardio, lose weight, and reach your physical fitness goals. You’ll also improve other skills like endurance, balance and flexibility, all while engaging with other people, improving your mental health, boosting self-confidence, and, yes, learning to defend yourself. While many of the techniques will take some time to learn, it should be a great experience as you move away from the traditional workouts that no longer peak your interest into the exciting world of martial arts. It’s true that using martial arts for fitness training is very challenging and different, but also extremely rewarding. Succeeding will require serious effort, but if you commit to learning and growing, you’ll be able to experience tremendous health and fitness benefits.